This is what Pittsburgh lacks...Dave Barry and...and...I don't know what to call that thing. Is it a puppet? A statue? An underpaid actor in an enormous costume? On second thought, maybe we just need Dave Barry in Pittsburgh. Bring back some of that fertilizer they're obviously using out there in Minnesota. Like to try sprinkling a little of that down someone's pants. Amy, did you have someone particular in mind? Boy, talk about inadequate - those are some BIG hands. But WHAT IS DAVE DOING IN MINNESOTA??? Are Michelle and Sophie with him? Did he dismember Ridley and shove him into a wood-chipper machine? Where is Frances McDormand? We need answers! They have streets in Minnesota? Who knew? 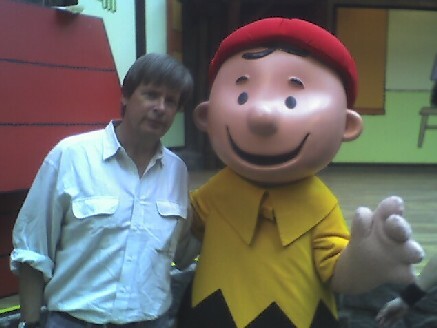 Thanks for posing with Charlie Brown. 5 cents please. are there any actual people there, or did you go to toontown? I think that the most strange thing is the lack of the ubiquitous blue shirt. Minnesota, the new twilight zone. If that's not a blue shirt, it's the bluest white shirt I've ever seen. But why is Charlie Brown wearing a beret? Happiness is a warm Davie? You're right, all the good Charlie Brown comments are taken. Do I get bonus points for spelling "you're" correctly? I'll betcha Michelle is there..... He's at the Mega Mall! No woman would miss a chance to shop there, nor would Sophie miss the rides at Camp Snoopy !!! Me, I've been there enough times to last a life time, and several Credit cards!! Dave! You look like you've lost weight! You look good! Now stop or we'll start a Dave needs a sandwich campaign. Dave, are you currenly accepting marriage proposals? [trumpet] "wawaa wa wawa wa wawa"
If Dave is losing weight, it must be becuase of the all you can eat lutefisk buffets! Here Dave, Blockhead needs a break.. so I'll hold the football while YOU run up and kick it this time. "[trumpet] "wawaa wa wawa wa wawa""
Actually, the famous "voice of adults" on all Peanuts specials was a trombone with a plunger (yes, the same kind of plunger you'd use in the toilet, but preferably not one that had already been used that way). I think Ole Blockhead is wearing the beret (which IS raspberry, I might add... the kind you'd find in a secondhand store...) because the characters are reenacting the episode where Charlie and Linus get a gig reciting beat poetry in a coffeehouse. Poor guy must've suffered some severe finger trauma from all the snapping. Why does Charlie Brown seem to be wearing a beret? Is this the French version?